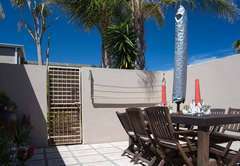 4A Human is a property providing self catering in Melkbosstrand for up to 6 guests visiting the Blaauwberg region. 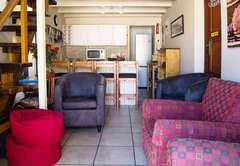 This affordable self catering apartment is separate from the main house at 4 Human Crescent. 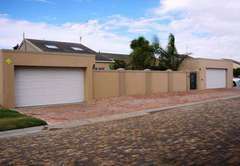 It has a private entrance, its own court yard with braai facilities and a double lock up garage. 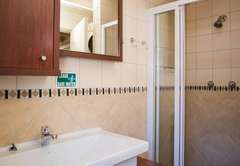 The unit has three double bedrooms, of which one is downstairs and two are upstairs. 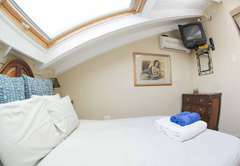 The main bedroom is equipped with air-conditioning and a TV. 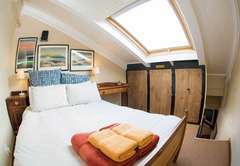 The two upstairs loft rooms have air-conditioning and share a bathroom. Bath towels are supplied as is bed linen and a hairdryer. 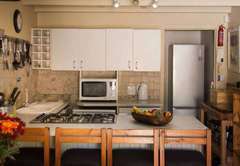 The fully equipped kitchen has an under counter oven, a hob, microwave oven, fridge / freezer, dishwasher, washing machine, tumble dryer, coffee maker, electric frying pan, slow cooker, toaster, crockery, cutlery, iron and ironing board. The living area is equipped with DStv and a DVD player. 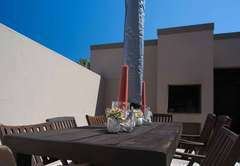 There are braai facilities in the courtyard and a double garage. Steep stairs to loft rooms makes it unsafe for toddlers or the elderly. Melkbosstrand boasts lovely, safe beaches and is an ideal spot for water sports. Hiking trails can be found less than 1km away. There is also a golf course nearby. The unit has three double bedrooms, of which one is downstairs and two are upstairs. The main bedroom is equipped with air-conditioning and a TV. 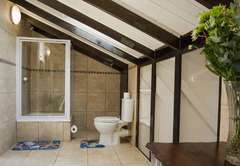 It has a bathroom with a shower. 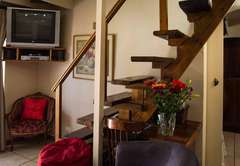 The two upstairs loft rooms have air-conditioning and share a bathroom. 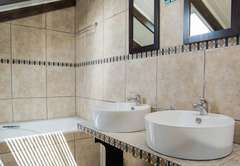 Bath towels are supplied as is bed linen and a hairdryer. Child policyChildren of all ages are welcome. Steep stairs to loft rooms makes it unsafe for toddlers or the elderly.